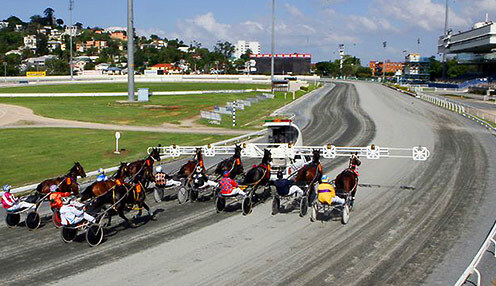 Trainer Craig Cross has decided to extend First String's Queensland campaign after he added another feature to his collection when triumphant at Albion Park on Saturday night. The three-year-old won last season's Group One Qbred Triad Final and was back to successfully defend the title, much to the delight of Cross, who has opted to change his plans in the wake of the win. "He will stay up there for another run to try and pick up his bonus," Cross said. "We've got two-year-olds which will be going up for the APG series in a few weeks, so he will stay until then and come back with those. He will stay up there for another run to try and pick up his bonus. "After that he will have a short freshen-up before we take aim at the New South Wales Breeders' Challenge." With top reinsman Luke McCarthy in the sulky, First String forged his way to the front at the top of the home straight, before staving off a late challenge from Lifes Black to score by a head, with Left A Terror three metres away third. "He went enormous," Cross added. "It was good to see him bounce back last night as he went terrible in Bathurst, but I discovered after the race he had an abscess in his foot. "With his foot fixed and the way he worked on Tuesday before heading up, I knew he was ready to win."